Thinking of God as a male human(s) out in the universe somewhere seems to be a primitive, magical, supernatural, and archaic conception of the Divine, literalizing the pronouns of “He” and “Him,” and in the Christian tradition of “Father” and “Son.” I’ve written about this specifically at least once before, but it’s worth discussing more. The most wise theologians, mystics, philosophers, and metaphysicians in Christianity seem to have moved beyond these anthropomorphic conceptions millennia ago, and yet there are many who still abide by them today. Why? I think there might actually be a place for this kind of parent/child or patriarchal-matriarchal relationship to the Divine in the spiritual journey, but it is usually early in the journey, and I think it is meant to be transcended to something much more profound. Jesus didn’t merely talk about the “Father” “out there,” he came to understand the “Father” inside himself, as I’ll talk about more below. As a Mormon, I believed for over three decades that God was literally a man (or two men… or, maybe three… or are there more, perhaps an infinite number? ), out in the cosmos somewhere, perhaps living near a planet or star named Kolob. Why? 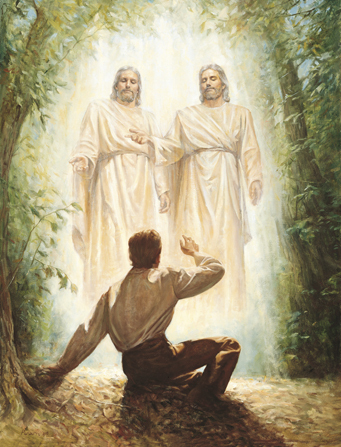 Joseph Smith said he saw and spoke with God, directly, and he said God was two male humans! How can you argue with that? Many critics simply deny he had such a vision at all, that he made it all up, which I strongly doubt; the general pattern of mystical experience is too common throughout history and around the world (sometimes referred to as the perennial tradition or philosophy. And I think there is evidence of what I’ll be talking about below even in Joseph’s experiences). But I don’t think this conception of God is that “simple” anymore. The Father and the Son aren’t simply two human males living on a distant planet or in a distant cloud or heaven someplace, either in our universe or outside of it, whether they have a wife (or wives) and children with them or not. The conception of God as “an old (sometimes angry, jealous, and tribal) man in the sky” is considered by most scholars to be quite archaic and has mostly been relegated to antiquity. And yet, I’ve moved to a new perspective of the Divine which I think transcends this conception, but also includes it. How could it possibly include it? I think those sages, mystics, prophets, and contemplatives throughout history have come to know the Divine as the very core of their own being, the essence of what they themselves were. God was in them. And these were mostly male humans that recognized this (or at least that we have records of recognizing it. Surely there were women too! And we have some record of the Divine Feminine because of it, but they’ve been buried in our male-dominated recorded history). God was therefore considered to be a male human, because male humans discovered God within themselves, their true Self, the ground of their Being, that they were physical manifestations of God/Reality in the flesh, God’s very Incarnation, and they came to reflect God-like actions in their words and deeds. Men were “made Gods” (apotheosis). And yet, something was lost in translation, because instead of keeping the understanding and experience of an immanent God within, people tended to project a dualistic God “out there” in space that was still a male human. They only saw God in the sage, the prophet-mystic, and when that sage died, then the God in them must have moved out or ascended into an invisible spiritual realm, a “heaven.” We lost the identification of God within our own human/divine Self, that God was the basis not only of humans, but of all things, all beings, all life, the ground and essence of all of creation in physical manifestation, that God could be found and known within our own Consciousness, each and every One. In Judaism, the use of the ‘Father’ title is generally a metaphor, referring to the role as Life-giver and Law-giver, and is one of many titles by which Jews speak of and to God. The Jewish concept of God is that God is non-corporeal, transcendent and immanent, the ultimate source of love, and a metaphorical ‘Father’. 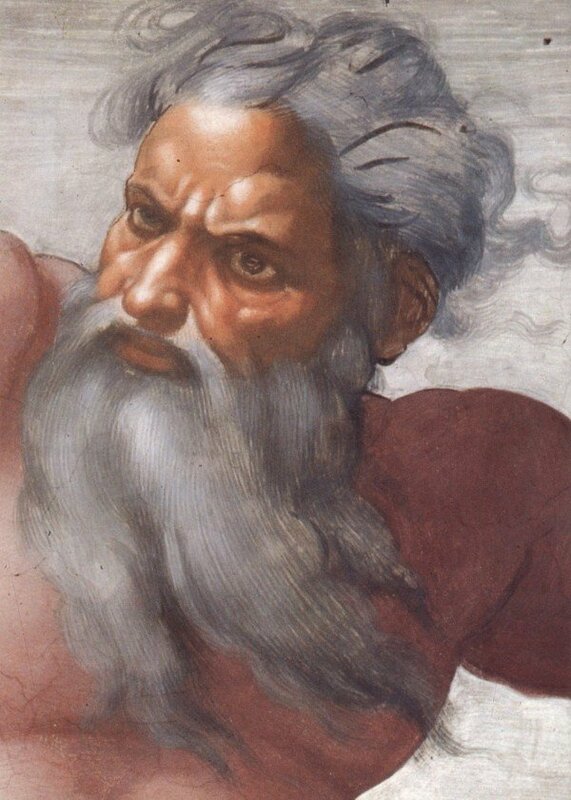 It’s a stretch to conclude that since Jesus referred to God as “Father” that he therefore thought God was literally a male human out there in the universe somewhere. Rather, Jesus seems to have explicitly expressed on many occasions that the Father was immanently “in” him, not outside of him, that he himself was the very expression of the Father’s will, form, words, being, action, etc., in the world. He was in the Father, and the Father was in him (John 14:11). If you saw Jesus, you saw the Father (John 14:9-10; as if Jesus was saying “duh, Philip, I’ve been right here all along!“). When Jesus addressed the “Father,” it seems to me that he was directing his attention in a transcendent mode to God as found deeply in all being, his human nature inclining itself towards the divine nature in him and all of Nature, his “natural man” ego realizing its smallness and insignificance in the presence of a deeper and more universal Divinity being expressed in him and throughout the whole of creation, towards the One Source of Jesus’ finite body-mind who as Logos had taken on flesh as his own finite body-mind, and the flesh and materiality of all beings. He was surrendering his ego-self mind towards the God who encompassed and sustained not only him but all of creation. The God I knew looked like this, yes, a bearded male human, and very familiar indeed. Blasphemy! So, no, I don’t think that God is a bearded male human or humans, even though I too as a bearded male human have come to experience God as my own deepest Self. I too have seen and known God, and God was not apart from me, but was my own Self, far deeper than all “Bryce.” Bryce was nowhere to be found when God knew God in me. I was One in God, and my Consciousness and Being was God. It wasn’t even my consciousness, but just Consciousness. It was God’s Consciousness that just happened to become aware in this particular human body you and I know as “Bryce.” That was God, and that God was experienced as Me. God’s Consciousness knew its Self. God didn’t know its Self as something or someone “Other,” of course, but as its own Self. Peering out from the eyes of pure Consciousness, all that I beheld was God, all that God beheld was God, and the Consciousness beholding It was the Source of its Self. I know. This all starts to sound pretty nutso mystical, and perhaps the most extreme form of egocentrism (“I am God!“), but I can assure you that there is perhaps no other experience that one could ever have that is more paradoxically empty of ego, and yet so full of God-Self. The absolute nothingness or void of the ego-self comes to be known as the absolute Fullness of God-Self (see Moses 1:6, 10-11). And this God-Self doesn’t just encapsulate the finite-body in which it is realized, but extends Infinitely in all directions. There is no boundary to that Self. Everyone and Everything is included in It! For, contradictory as it may sound, it seems to me that the deepest spiritual experience can arise only in moments of a selfishness so complete that it transcends itself, by “the way down and out,” which is perhaps why Jesus found the companionship of publicans and sinners preferable to that of the righteous and respectable. It is a sort of first step to accept one’s own selfishness without the deception of trying to wish it were otherwise, for a man who is not all of one piece is perpetually paralyzed by trying to go in two directions at once. I realized then that God is in and through all things, the very Soul of all people (male and female! ), all life, all things, and all beings in creation, the Life and Love and Light-Energy that holds all the universe together as One, that is the substrate upon which the Cosmos itself is woven and is being weaved. This uni-verse really is “one song.” God is our own pure Consciousness, our own Spirit, the Light of Life, the foundation of Mind, that Energy that is the source that drives and animates all perception, intelligence, creation, beauty, truth, and goodness. We are all “gods” in God, as innumerable as the sand on the seashore, God/Reality having unfolded or manifested its Self as our being and each and every being in the Whole of creation. The One. Yes, God is in you too, and has expressed its Self as You, even if the ego-self you doesn’t know it. And the ego-self you can’t know it, really, because the ego-self isn’t God. Only the God in you can know the God-You. And even me telling you this won’t convince you. Only You can come to know it, the Divine You, the Divine in You. It is a direct experience of Self as One that is life-transforming, when the separate ego “dies” as on a cross, that is mind-changing (metanoia). As the Apostle Paul taught, “in [God] we live and move and have our being” (Acts 17:28). In God. And when the ego falls away from the mind, we discover “Christ” living in us, because we are “One in God” (Galatians 2:20; or Atman, or Buddha-nature, or al-Insān al-Kāmil, or Tao, or Messiah, or the Great Spirit, etc.). Thus, as Paul well-noted, God is not something that should be unknown, or is very distant on some distant planet or star, for God is our very own Being, nearer to us than we are to our Self. God is not an object, but the Subject, even the Subject in ourselves and all of Creation. Do you know your Self? “Know thy Self, and you will know the Universe and the Gods” (an ancient Greek and Egyptian aphorism, with a bit of a change).